In Part I of Storyboard Myths Debunked we talked about how you don’t need to be an amazing artist to create amazing storyboards – AND – that you no longer need to have a giant film budget to create storyboards…the necessary element of a successful and polished production. Now, enjoy Part II of StoryBoard Myths Busted! MYTH #3: Storyboards show every shot of every action. FACT: It’s easy to get hung up trying to show every emotion that crosses an actors face in your storyboards, but that’s not the primary purpose of storyboards. Use your storyboard panels to show shot setups, indicate camera movement and establish sequences to help compile a cohesive storyline. If you find yourself looking at your storyboard and saying “but he’s not smiling”, you’re focusing on the wrong element – it’s about the shot setup, i.e. where the actor or actors are standing, how close or far are they from the camera, what’s the location. Your actors will have the script before the shoot and that’s when you’ll do some rehearsal/directing (you can even share your boards to help them see what you see before production). Then when you’re on the set and the actor is in the shot, that’s the perfect time to direct and pull it all together! MYTH #4: You must create elaborate storyboards to get your point across. FACT: Storyboards, like any media communication, need to fit the audience. Are you the writer/director? If so, a simple shot layout may be all you need to remind you, when you’re on the set, of what the next shot set up will be. If you are pitching an idea to a group or a client you might want to use broad concepts until they buy into your premise. This keeps them focused on your idea and prevents them from getting hung up on minor details. So “know your audience” for your storyboards and present just as much detail as needed to communicate. Time is precious and so is your budget – spend each where it counts! 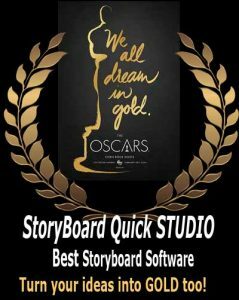 StoryBoard Quick and StoryBoard Artist storyboard software products will help you achieve your goal.